(X) Lee Archer, shown above, is wearing two types of flight helmets. 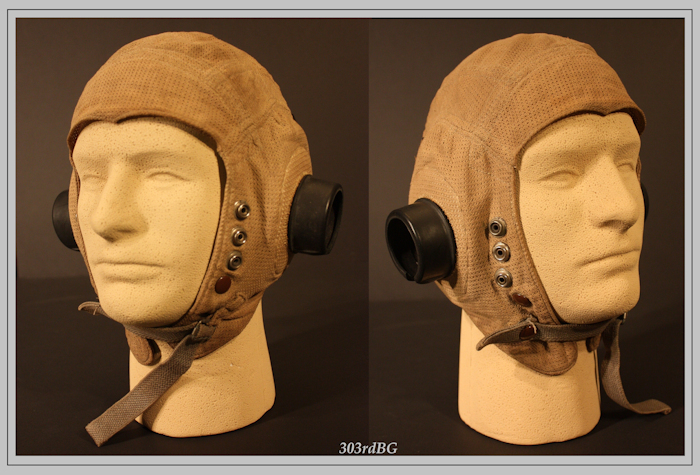 As best as I can determine, the helmet on the right is the RAF first pattern type D. The forward goggle straps as well as the early rubber flanges around the earphones have been removed. These rubber flanges are easy to remove and are not attached to the rubber "cup" receivers in any way but are slipped over them. Because of the poor quality of the photo, I should add the possibility the helmet may be an RAF E type helmet. Concerning the photo on the left, the helmet I'm fairly certain is the early RAF type B model. Archer wears the 6530 goggles in both photos as well as the RAF 1941 life preserver. Photo left shows the American I D armband as well as the A-14 o2 mask. My example of the D helmet is a reproduction made by SEFTON CLOTHING COMPANY OF COLCHESTOR ESSEX ENGLAND. SEFTON made several great helmets for RED TAILS. (X) Shown above is the hard to find RAF type E flight helmet, very similar to the RAF type C "family" of helmets. It is constructed of a loose open weave for use in hot climates. 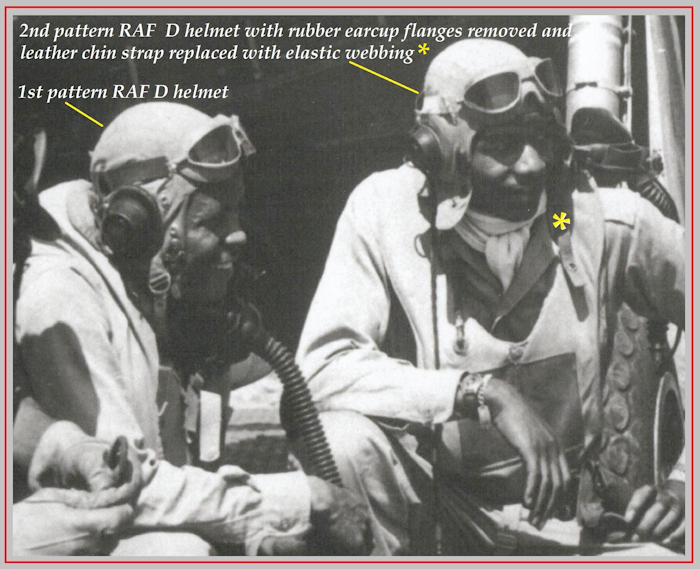 As mentioned above in the Lee Archer caption, in a poor quality black and white photo it may be hard to see the difference between the RAF type D and E.
(X) Shown above L-R. are pilots, #1 Dempsey Morgan wearing a RAF Type B flight helmet and RAF Life preserver. The next man, #2 Carroll Woods wears the RAF first pattern D helmet. I cannot positively ID the mae west. Next is #3 Robert Nelson who wears the 2nd pattern / intermediate version of the type D helmet. The external rubber ear cup flanges have been removed. The neck strap has also been changed from the Bennett type buckle to a simple flexible strap with a single snap on the end. Nelson is wearing a B-3 life preserver. Pilot # 4 Andrew Turner wears a RAF type B helmet with RAF life preserver. 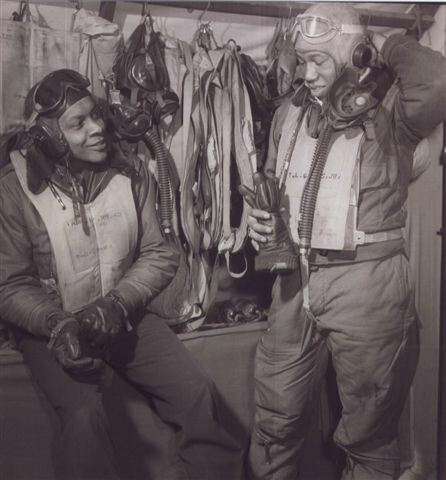 # 5 Clarence Lester wears an A-11 helmet and B-4 or B-3 type life preserver. All of these gentlemen are wearing AN-6530 goggles and all the oxygen masks are the A-14 type. 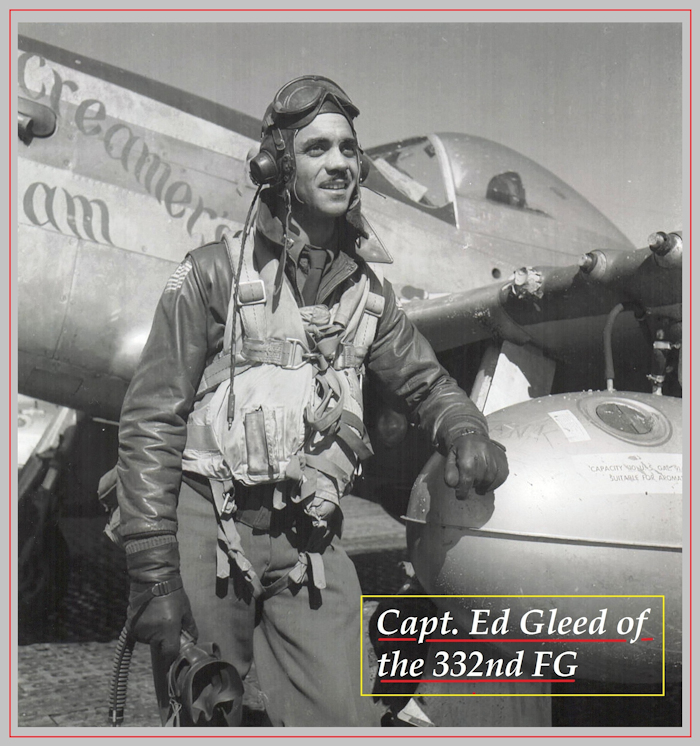 (8) Shown above is Captain Ed Gleed, posed by the extra fuel tank (drop tanks) of his P-51. He holds the A-14 mask in his right hand. The RAF 1941 life preserver has three pieces of Kapok that is inserted into the preserver. It looks like Gleed may have removed the piece that goes behind the neck. The other two kapok pieces are present and you can see a portion of one protruding out of one of the small openings at the bottom of the vest. Note the American flag on his A-2 and the tape put on the barrels of the three wing guns to keep out dust and dirt. (7) Shown above is one example of what the typical Tuskegee fighter pilots wore during the last year of the war, flying out of Ramitelli Air Field in Italy. This example is based on Capt. Ed Gleed. Shown are: B-8 goggles on top of the early RAF Type C helmet; The seat pack parachute over the 1941 RAF Mae West; The A-2 jacket and the A-11A gloves with removable knitted wool insert. 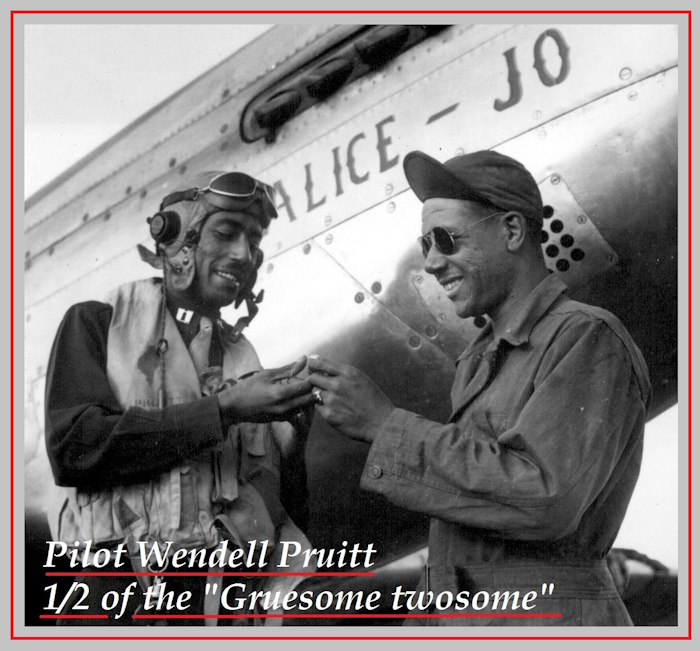 (In Tuskegee photos the pilots are wearing the A-11 version, which has a wrist strap.) Also shown above is the M-3 holster for the 45 Cal. pistol with WW1 ammo pouch for 2 extra magazines. Many of the pilots were issued this weapon. The pilots also wore the B-10/A-9 pants (shown below on this page). I also noticed several of the pilots wore their A-4 or AN-6550 flight suits over their B-10 instead of under like so many 8th and 9th pilots did. 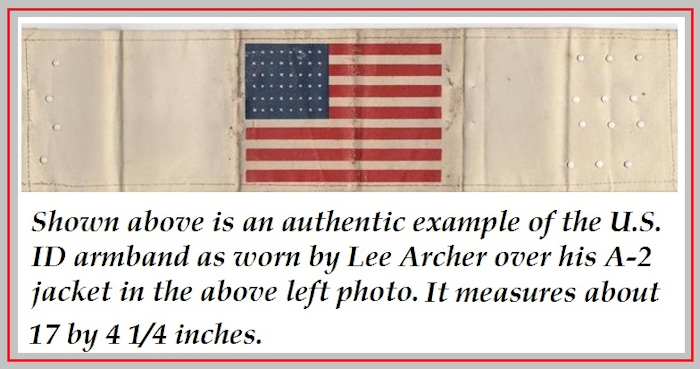 The painting of the American Flag shows up on many Tuskegee A-2s (The 15th AAF Bomber Crews did the same). This late in the war I would have expected to find them wearing the B-8 parachute like so many 8th and 9th fighter pilots. But this wasn't the case. The presence of seat pack chutes dominate the photographs. Other items worn by them were the B-3 and B-4 Mae West. Also the RAF 41 pattern gloves and RAF MK VIII goggles are shown below on this page. 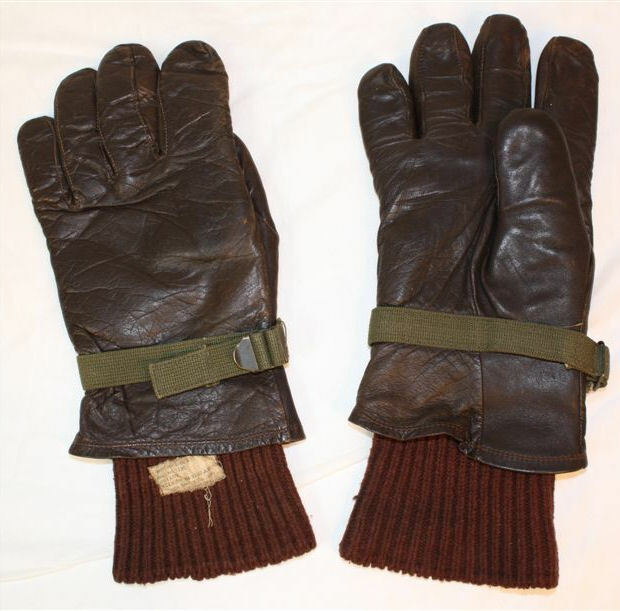 (9) Shown above is a pair of A-11 gloves as seen in both wartime Tuskegee photos. It is a rare glove to find. 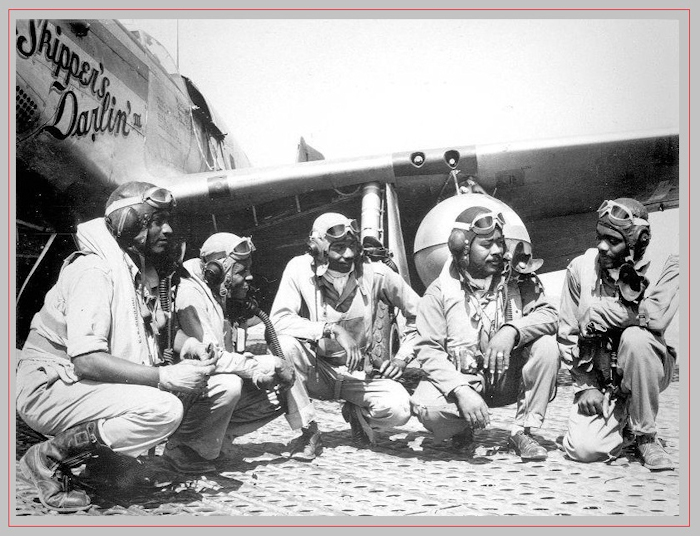 (10) In researching the clothing and flight gear worn by the Tuskegee airmen during the last year of the war, it was high quality photos like the two above that verified what was needed for the movie "Red Tails." The man on the right is wearing A-9 pants. Both the men wear B-10 jackets. The Mae Wests are the B-3, B-4 or 6519s. The man on the left wears the A-11 helmet with B-8 goggles. The man on the right wears the RAF D helmet with 6530 goggles. The photo also provides us with two great views of the A-11 winter gloves. You can see the white label on the cuff of the wool knit liner, which was removable. The oxygen masks are A-14 with internal microphones installed. In October 2008 the costume designer for the new movie "Red Tails," Allison Mitchell, saw this website and expressed a desire to see the collection personally. When she mentioned she was flying from England to Lucasfilm at Skywalker Ranch, I volunteered to bring all of the collection there and set it up. I left the collection for about two weeks and Ali explored every detail as to what the American fighter pilots and bomber crews wore during the last year of the war in the ETO. I was very impressed with Aly. No detail was too small. I was asked to be a consultant/buyer and got an opportunity to go to the filming of the airfield scenes just outside of Prague, Czechoslovakia. When it comes to the flight gear, uniforms and costumes in general, Ali did a fantastic job. The reproduction B-10 jackets came from various sources. All looked great. The A-6 and A-6A boots were great. When it came to reproductions, I never heard Ali say "that's good enough" or "don't worry about it, the audience will never catch it." She had to send examples back several times before the manufacturer understood the true concept of what "exact copy" means. 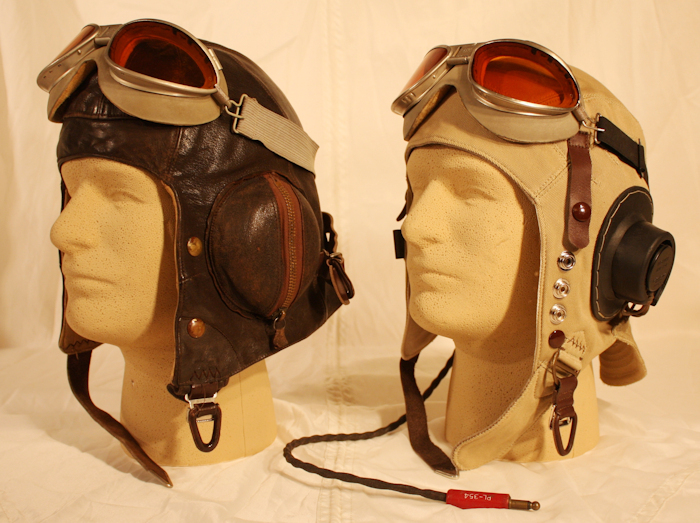 A wide variety of flight helmets and goggles were used and the majority of the flight gear was authentic. One bomber pilot was dressed wearing all authentic flight gear. The F-2 heated uniform as well as other flight gear will make its debut in this movie. 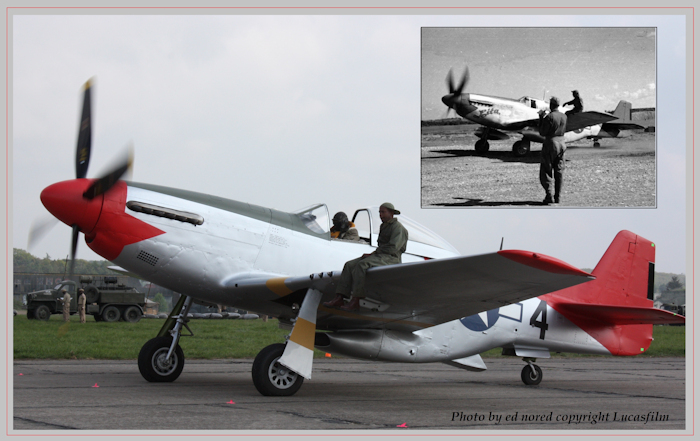 It was great to put my collection to work and make a small contribution to the "Red Tails." 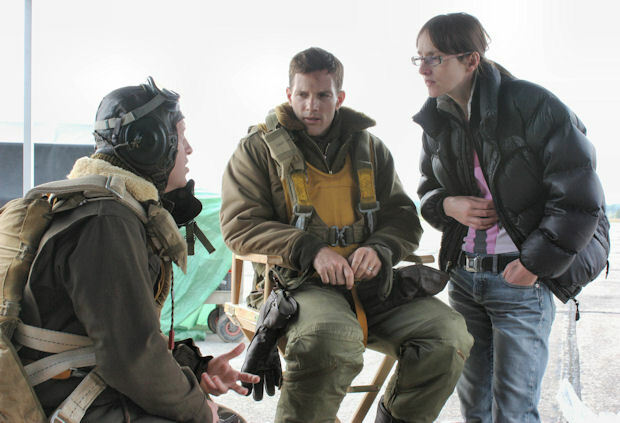 Shown above and below is Allison Mitchell the costume designer for "Red Tails." She's in conversation with two actors playing a pilot and copilot of one of the B-17s in the movie. It would be a shame not to show the effort made to equip the pilots and bomber crews with the most accurate and authentic flight gear available. The actor on the left is wearing an authentic F-2 heated suit, complete with all its wiring. Authentic F-2 felt boots, B-8 parachute, A-11 helmet, A-14 mask B-8 goggles, scarf, Mae West and, not shown but provided, the rayon gloves. The heated gloves are reproduction and the first aid kit is a reproduction. I provided the majority of first aid kits. I obtained empty ones from service of supply and filled them in such a way as to look as real as possible. With an intent to show the outline of the Morphine box. Parachute first aid packs all take on their on unique shape. The actor on the right is wearing all authentic head gear. Worn underneath is a authentic F-3 heated suit. 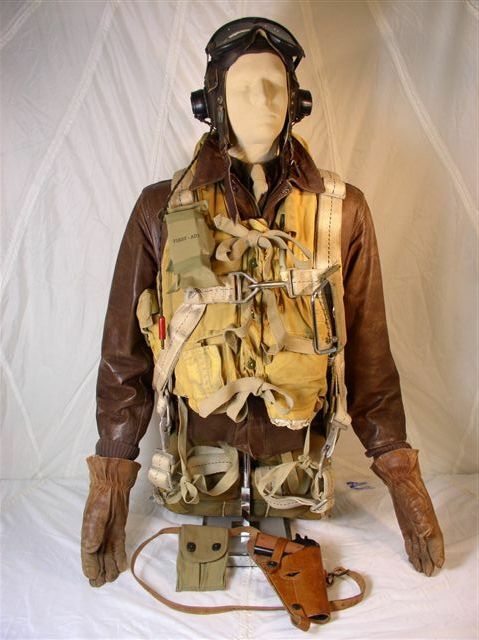 A-9 pants, Mae West, and a rare OD authentic A-3 parachute harness. The B-10 jackets in "Red Tails" are all reproductions. They came from a variety of sources. Ali was very meticulous, as with all of the items, in getting the best. The A-6a boots are reproductions as are all the A-6 boots in the movie. Except for the one pair I sold them, new out of the box. In regards to the rest of the movies flight gear, all the American made Mae Wests are authentic. A mix of authentic and reproduction RAF 1941 pattern Mae West were used. All the flight pants were A-9 for primary actors and A-10's for the extras. All the goggles were authentic, A-14 masks of course were authentic. 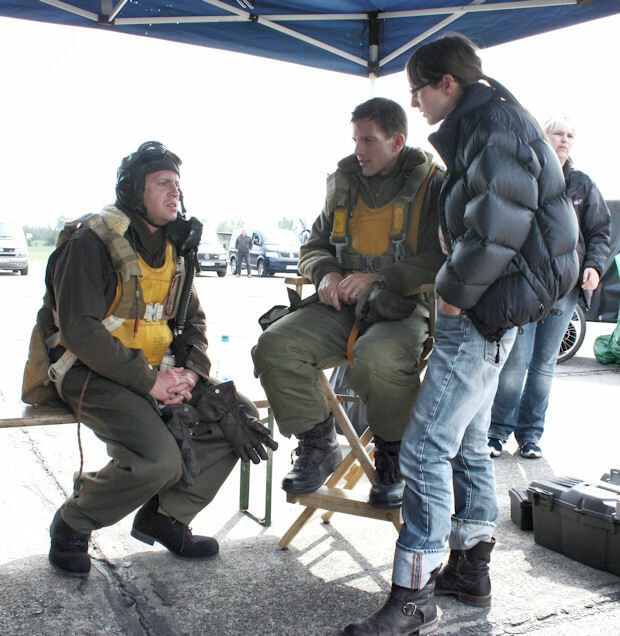 Most of the bomber crew actors are wearing their F-3 or F-3a heated suits under their B-10s. A F-1 blue bunny suit was worn by one actor. The flak helmets were all authentic.